Is the United Nations complicit in the smuggling of weapons and ammo into Syria? In December 2015, Russia expressed its concern at the UN Security Council that arms shipments as well as “rebels” were entering Syria via U.N.-monitored checkpoints at which U.N.staff are “supposed to check the relief cargoes” (Tass January 5, 2016). It would appear that routine weapons shipments into Syria have not been the object of UN cross border inspection. 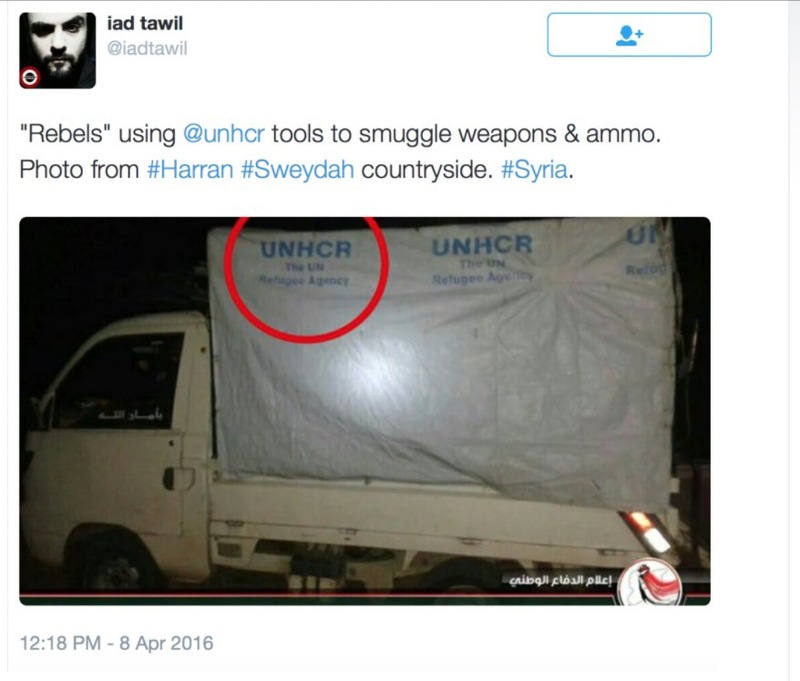 A recent report (yet to be confirmed) suggests that UNHCR trucks are being used to smuggle weapons and ammo into Syria (see twit and photo below). The following January 2013 text is displayed by the UNHCR’s mouthpiece Refugees Daily without acknowledging the fact, amply documented that the “Rebels” are al Qaeda affiliated militia. Syrian rebels say they fear that weapons pledged recently by the United States and other international backers will not come in time for them to make gains against the forces of President Bashar al-Assad. …. U.S. officials have said that the CIA is preparing to deliver limited shipments of weapons and ammunition to Syrian rebels through clandestine bases in Turkey and Jordan. A senior Middle Eastern official said last week that although most weapons have entered Syria via Turkey until now, there are plans to increase the use of the Jordanian border as flows increase. Mohammed al-Zoubi, one of dozens of seasoned smugglers in the Jordanian border city of Ramtha, said ordinary pickup trucks and open borders could facilitate the supply of thousands of rockets to rebel fighters in the southern Syrian city of Daraa — as soon as they get the green light and the weapon shipments. “The UN refugee agency’s top protection official has warned of the enormous humanitarian impact of the Syria crisis, particularly on civilians who have been displaced and face threats such as gender-based violence. It is also, for many, accompanied by gender-based crimes, deliberate victimization of women and children and a frightening array of assaults on human dignity,” Assistant High Commissioner (Protection) Erika Feller told the UN Human Rights Council in Geneva on Tuesday.